I borrowed my wife's car while she was out of town and this happened. She wasn't happy that she wasn't there for the event. Oops! nice. i'm not even half way there yet!!! Damn, thats awesome. Any major problems leading up? Toy1mzfe wrote: Damn, thats awesome. Any major problems leading up? Nope! Car is in great condition. I clunked a little when the throttle was applied. I think it was the differential. I bought a used transmission online and replaced the whole unit. At that time, I did a bunch of other preventative maintenance (clutch, throwout bearing, lightened flywheel, pressure plate, rear main seal, some suspension parts), but it wasn't an emergency. I'm not a huge fan of the looks of the car, but it has been great and I do my best to keep it looking good. 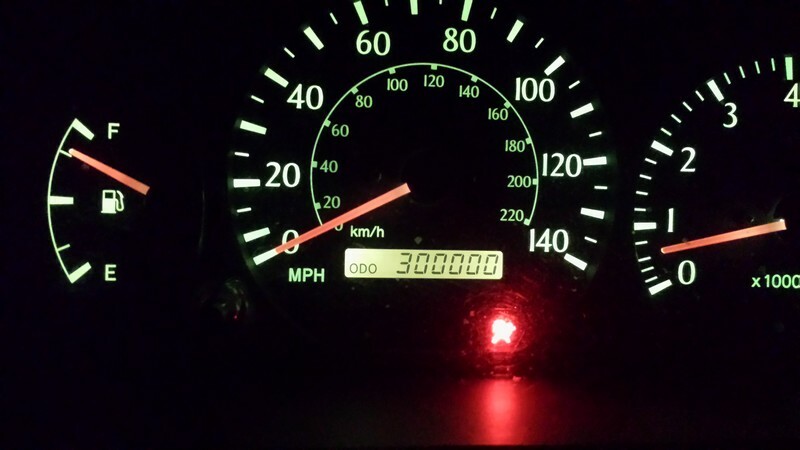 I drove it to work today and it now has 307,000 miles on it.